Did the Chargers get away with one against the Chiefs? The Chargers got away with one on Sunday. The Chiefs lost in overtime in San Diego on Sunday, but the ending was anything but simple. With less than a minute remaining in the fourth quarter, kicker Ryan Succop missed a field goal that would have given the Chiefs the lead and possibly the win. The kick went wide right. However, if you look closely, the Chiefs should have had another chance at the field goal. Doug Farrar from Sports Illustrated pointed out that the Chargers had seven players on the left side of the ball. Why is that significant? 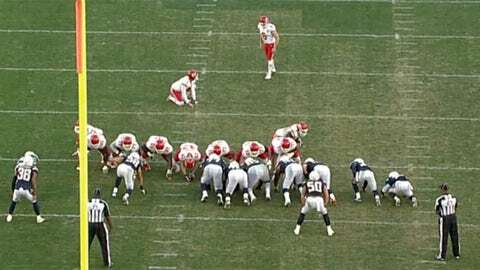 the NFL’s competition committee passed a rule before the 2013 season that banned teams from having more than six players on either side of the long snapper during a field-goal attempt. The officiating crew working the game simply missed it. As a result, the Chargers went on to win in overtime. NFL on FOX rules expert Mike Pereira noticed the play and commented on it. Now, the Chiefs already had the fifth seed in the AFC playoffs locked up, so the loss didn’t affect their seeding. However, the Pittsburgh Steelers would have made the playoffs with a Chargers loss on Sunday, so all of Black and Gold Nation will undoubtedly be up in arms over this oversight. Of course, Ravens fans may say this is more an instance of what comes around, goes around, and that the Steelers simply got what has been coming to them since Thanksgiving. Right, Mike Tomlin?